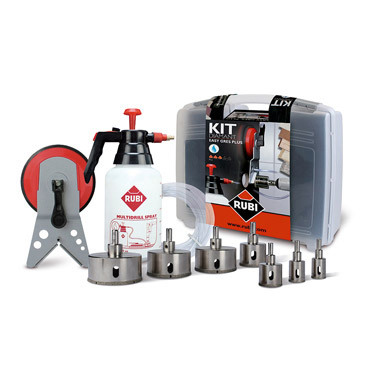 Rubi Easy Gres Plus Kit. Includes multi-drill guide, water pump and hose, sturdy plastic carry case and Rubi Easy Gres diamond tile drill bits (capable of cutting around 10 holes in porcelain tiles if used with the correct pressure and water cooling). Includes the following Ø size drill bits: 20mm, 28mm, 35mm, 43mm, 50mm, 68mm and 75mm.